First airing in October of 2012, Jojo’s Bizarre Adventure tells the story of two intertwined fates. The first of Dio Brando a young boy who – through the passing of his father- becomes the benefactor of the Joestar house. Unsatisfied with the hand he was dealt in life, Dio sets about attaining all the power he can, seeing the benevolent Joestar household as his first stepping stone. Meanwhile, with Dio’s arrival, Jonathan Joestar (the titular Jojo) soon finds that his life of youth and chivalry is about to be flipped upside down. Dio will take everything from Jojo, even turning his own father against him. 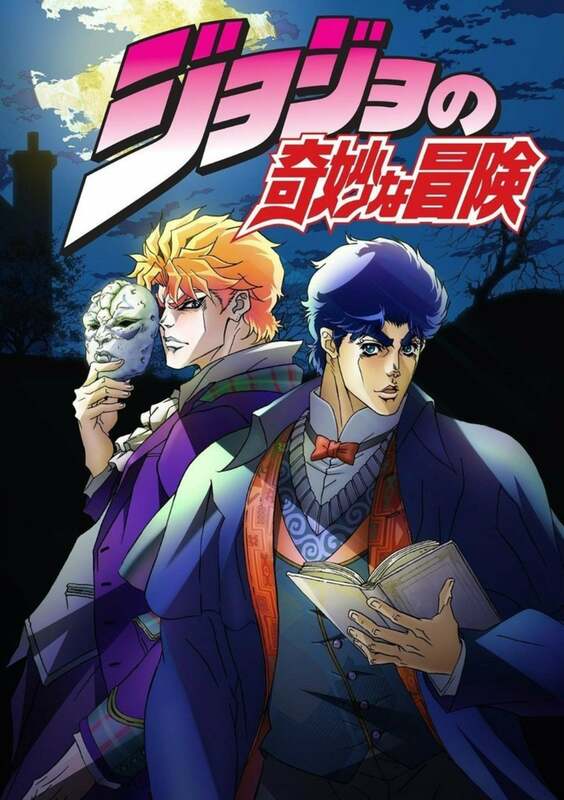 When Dio gets his hands on a mysterious stone mask with the power to resurrect the dead, Jonathan will have to learn the power of hamon to defeat his adopted brother. Their differences will result in the beginning of a never ending war between the immortal Dio Brando and the proud Joestar family. Jojo’s Bizarre Adventure is one of my favourite animes of all time, and I don’t say that lightly. There is just so much to love here, the over the top action and ridiculous story, the hilariously cheesy yet engaging dialog, not to mention the unique art style with its sudden colour swaps. The story of Jojo’s Bizarre Adventure is full of many ridiculous twists and turn with a comedic absurdity, but also full of really emotionally powerful moments that really tug on the heart strings. I really liked how the series was also split into two separate, yet interconnected character arcs, on for Jonathan and another for his grandson Joseph Joestar. Jonathan was an instant hit with me, his chivalrous and debonair attitude made for a really entertaining watch, inversely however I really didn’t like Joseph as a character at first, but the more time I spent with him, the more I came to enjoy his tongue and cheek attitude. As I previously mention, the art style of the show is incredibly unique. You’ve all probably seen the impossibly defined muscles and jaws so chiselled you could use them to draw straight lines, but this is only the very surface of the art style. There are always strong shading lines giving the show a very comic bookie vibe, the other thing that makes the are stand out so much is the colour change I mention earlier. At particular moments during the show, all or most of the colours make a dramatic shift to a different colour, yellow will become green and red will become blue. These changes always coincide with a tonal sift, like a new danger appearing or when someone is suddenly murdered. Its really cool stuff and I love it. Jojo’s Bizarre Adventure is a fun and engaging show full of plenty of action and entertaining banter and I strongly recommend everyone check it out. I rate this anime 8.5/10.